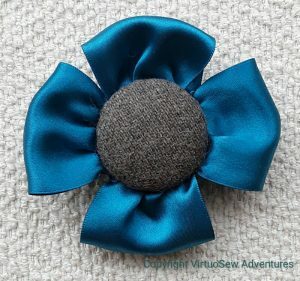 I was very taken with a length of gauze ribbon i found when I was rummaging for bits of teal fabric, and spent an idle moment or two running a gathering thread along one edge. 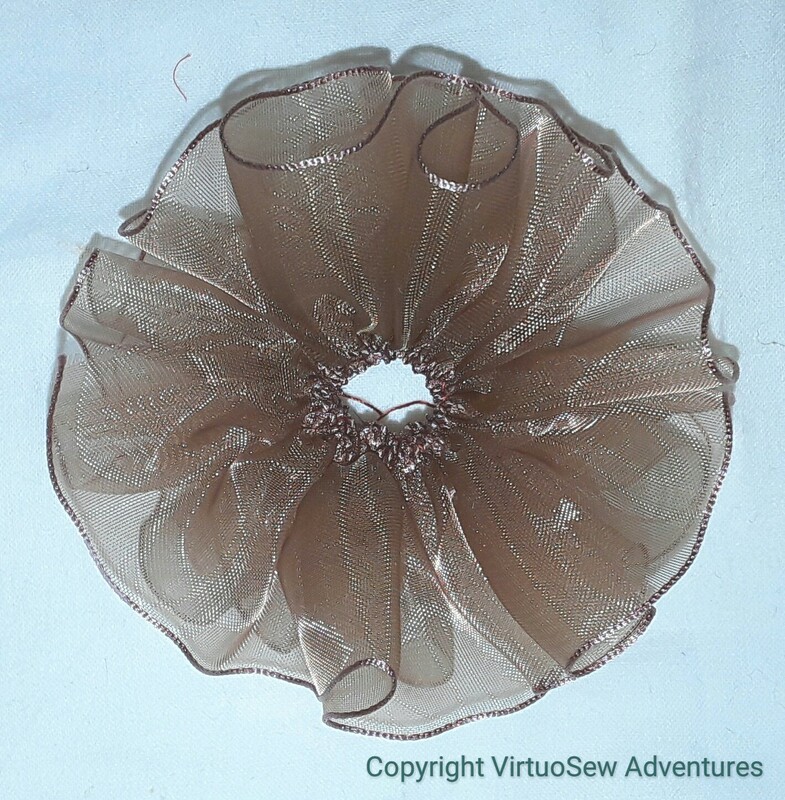 I wasn’t at all sure where I would go from there, but as I pulled the gathering thread up the ribbon settled naturally into a tight spiral reminiscent of an Elizabethan ruff. Hmmm. Promising! 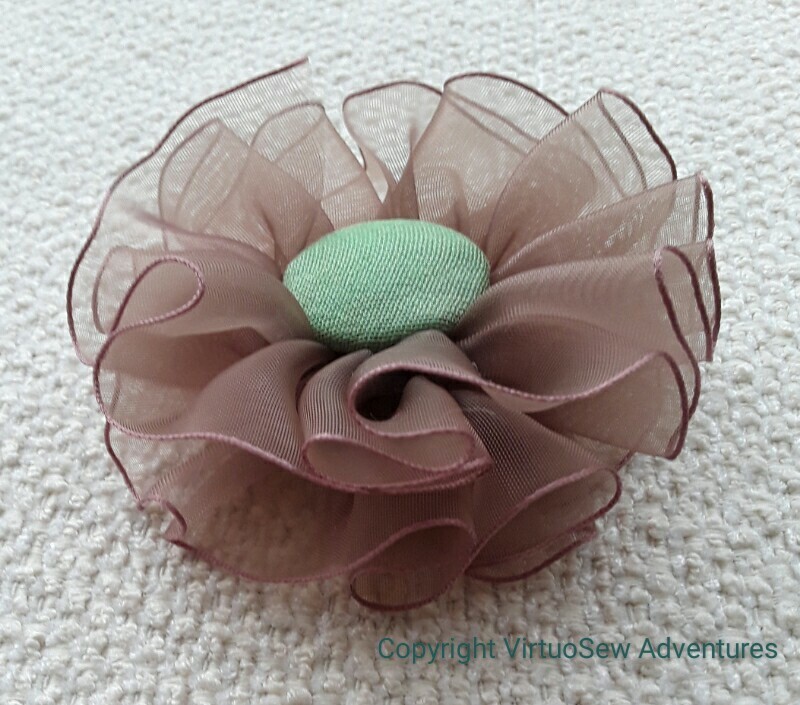 In the end, I covered another self-cover button with two layers of a rather gorgeous silk fabric which I originally bought for my mother to line a bookbox she made for a fine binding of “The Wind In The Willow”, and created a cross between a winner’s rosette and a new species of flower. I think it will be fun to wear, but the real delight is the ruffle… It has “loft”, and a gentle glimmer, both from the gauze and from the silk button. More of a spring than an autumn piece, with that light spring green and and the gauzy ruffle, but I’ll look forward to the treat! What I would really like to do is think of something else to do with the tweed fabric in the centre of this. It was cut off a pair of trousers which were too long for me, but it is a nice fabric and I want to create something fun with the scraps. That is gorgeous. 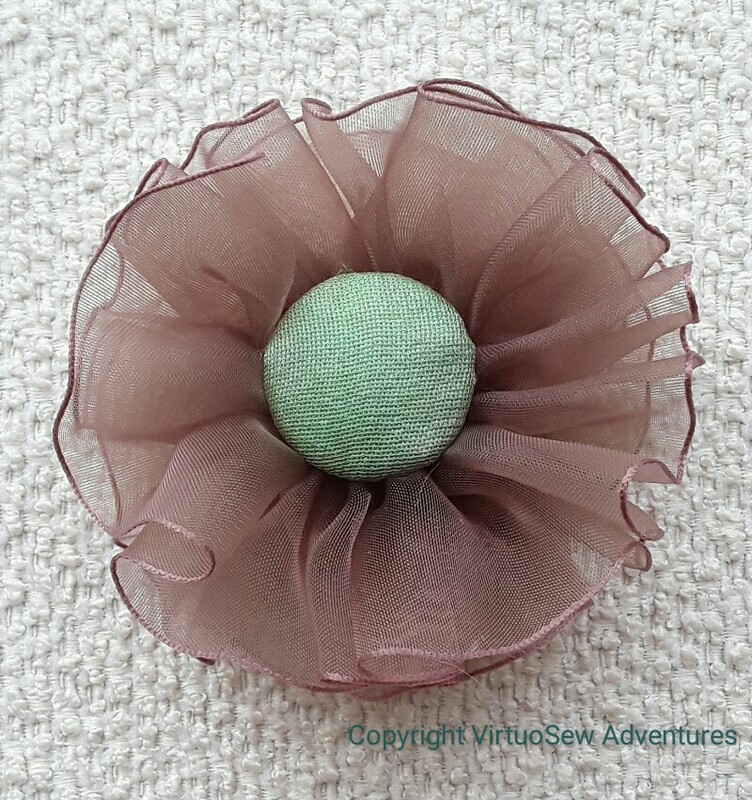 What about some beautiful fancy thread in a very simple design to contrast with the tweed? That would be a nice brooch. Some leftover are good to use to create another lovely thing. 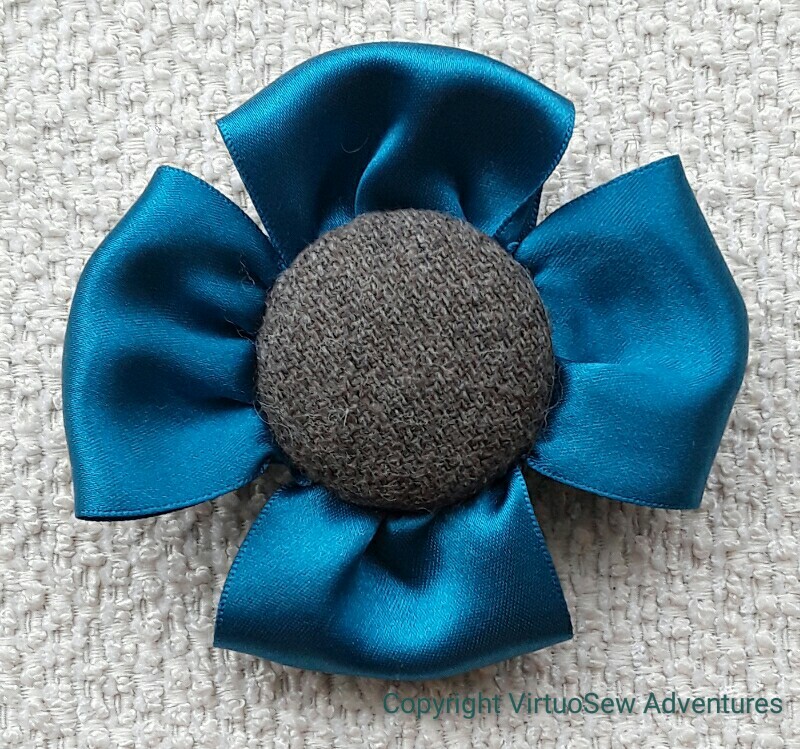 A few simple stitches would dress this lovely brooch up. They are nice the way they are as well. Re: leftover tweed & thinking caps . . . do you wear hairbands (“Alice bands”)? or it could become the side(s) of a pillbox-type hat. If there’s a lot of it (that is, the pants were _really_ long), it could be cut in wedges and sewn (points in the center of a circle) into a beanie/beret type cap. 🙂 Are you having too much fun? Bijoux! Very pretty! I love your gauze brooch. Maybe a simple running stitch in metallic thread for your tweed. It’s beautiful so I wouldn’t want to hide it completely! Definitely a reason to go shopping in the ribbon aisle. I love that! What did you use for the pin back? As for the tweed, it’s beautiful, and I could easily see it in any wool work, perhaps a pincushion with a winter scene?